We have been rather overwhelmed by the messages that have poured in, in response to the release into the world of our film, Luminous Journey: 'Abdu'l-Bahá in America, 1912. I will put some of these below, in case it will inspire anyone! Your work and service to the Cause by producing this film is truly a significant contribution to the field of education in America. I couldn't agree with you more that this effort is the beginning of a new "chapter of American history destined to change the consciousness of a nation." You work has far-reaching and wonderful implications! 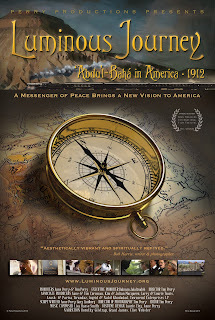 As an educator, I envision this film and history, along with other current and future develoments (such as Robert Stockman's book on 'Abdu'l-Bahá in America) embedded in a formal curriculum in schools from early childhood to university. I see development of educational objectives, a diversity of media creations, project ideas, service ideas, and, ultimately, the transformation that it could and would have upon all those who study its content in the spirit of independent investigation of truth. It is a great service in His path! “I saw the film screened at Green Acre on August 12th during the Homecoming Week. It looked lovely in that huge auditorium and the majestic sized screen. The sound (which is never good for ears like mine) was just fine. The evening started out with a jam-packed room - many friends came from the local communities, and they were very demonstrative as they viewed. There were many smiles exchanged, elbowing each other about this or that vignette, wonder at the beauty of the production itself. . . . It is lush and generous to the audience, filling the senses with what it could have been like to be in New York or Washington or Chicago with ‘Abdu'l-Bahá. It is a very effective suspension of time and place as the film transports you to the America of 1912 . . . an America engaged with such a special Visitor, delivering such an important and powerful message. After 100 years we can clearly see that Abdu'l-Baha was warning us about four eternal spiritual laws that should not be ignored or broken. He was so forthright about the equality of women and men, really challenging America to see this basic denial of human and civil rights to half of the world's population. Newspaper editors were shocked at the plain words He used about women and the right to vote, and the role of women in bringing about world peace. We ignore this law at our own peril, and we have done that for much too long. He was also so dramatic in his advocacy for the rights of African Americans, so long in slavery, so long on the tragic road of violence, so long in physical and psychological chains, so long reviled and so long the victims of a modern cruelty that still continues, even if the forms today are more subtle and polite. He spoke emphatically and without any fear of being contradicted or attacked. The film depicts His bravery at expressing love across the color line beautifully. His warnings about imminent war, and more wars that would follow in a world that remains divided in every possible way, in every sphere of human interaction, where nationalism and materialism have taken over hearts and souls, and led to a century of human carnage unparalleled in recorded history. He told us the antidote was authentic trust and authentic love at every level of life, and the world chose to ignore that. And we still ignore it. And finally, His bold and plaintive cry for the value of religion, raised in so many churches, synagogues and places of worship across all separations of color, creed and custom was vivid in the film. The idea that religion would be a cause for unity was so innovative in our religious tapestry that was so torn and tattered, especially in America, where every individual feels that they can pick and choose what is best for them and then call it a religion . . . and separate their communities from others. Some of the clergy understood, most did not. His energetic inter-religious dialogue and fellowship was remarkable, but His warnings fell on so many deaf ears. The film is a chronicle of warnings, so perfectly delivered, and so universally ignored. And we have 100 years of history to prove His message true and His warnings valid. The film also shows, in exquisite detail, the souls who heard the message and who changed their lives, their orientation, their very purpose in life to carry out the wise and healing teachings proclaimed all over America in 1912. Everyone at Green Acre was impressed with the attention to detail, the costumes, the cars, the trains, the hotels, the music, the very essence of that 1912 ambiance recreated so that we might become one of those noble souls who were changed by the message and the presence of the wondrous Visitor.